Seventy-five per cent of the Canadian apartment market is located in the Windsor-to-Quebec City corridor, but nowhere does the apartment reign supreme more than in Montreal. 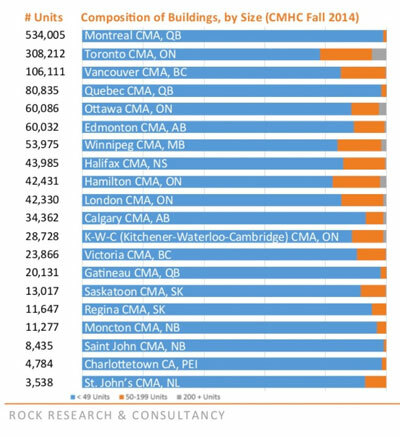 Quebec’s largest city has 534,005 rental units, far outpacing Toronto’s 308,212 and Vancouver’s 106,111, according to the inaugural issue of the ROCK National Rental Market Review that uses fall 2012 to 2014 data published by Canada Mortgage and Housing Corporation and ROCK Advisors Inc.’s own research covering 20 major markets across Canada. While Saint John, N.B., has the lowest average one-bedroom rental rates in Canada at $599, Montreal isn’t far behind at $655 due to its large supply of units and the fact that 99 per cent of its apartment buildings have 50 units or fewer while there are 63 apartment buildings in Toronto containing more than 500 units. At the other end of the spectrum, Calgary has fewer rental units than such smaller cities as Halifax, London and Hamilton, has a lower vacancy rate and the highest average rental rate for a one-bedroom apartment at $1,134. The Alberta city also had the highest 2014 rent growth at 6.4 per cent. “We’ve had rent controls in Ontario and Quebec since 1975, which has impacted apartment development, whereas western cities have grown more recently,” Lobo said of the discrepancy in rental rates and increases. While the economic downturn in Western Canada caused by the drop in oil prices may stall rent increases in cities such as Calgary and Edmonton, Lobo believes now is an opportune time to invest in apartments as long as people take that factor into consideration in their future cash-flow projections. “Why would people build apartments?” asked Lobo. “The perfect storm has happened. “There’s strong investor demand for apartments. There’s strong rental demand. Interest rates are at an all-time low, and the single largest cost of owning an apartment building is the cost of capital. And it’s never been cheaper. Because interest rates are low, cap rates are low and pushing apartment prices up. Lobo noted apartments didn’t take a major hit and stayed full during the 2008-09 recession, while the hotel market was whacked hard and condominium sales slowed. He added they’re also a safer investment than office properties, where the loss of an anchor tenant could be devastating to a landlord, while people will always seek affordable places to live and it’s not the end of the world if a tenant moves out. Rock Advisors has published two very extensive reports in the past: “The Ontario Apartment Report” and “The Canadian New Apartment Construction Report.” These were both glossy 72-page documents with masses of detailed information. “This is the first of this type of report that we’ve done,” said Scott Midgley, vice-president of real estate research and analysis at ROCK Advisors. “We really have done it as a test. So far the response has been great and I’m planning another similar report for the fall when CMHC statistics become available. Rock Advisors — which specializes in apartment building brokerage, construction and development — will produce the Canadian Apartment Symposium Series on April 21 and 22 at the Metro Toronto Convention Centre.